Sign up here if you plan to attend! 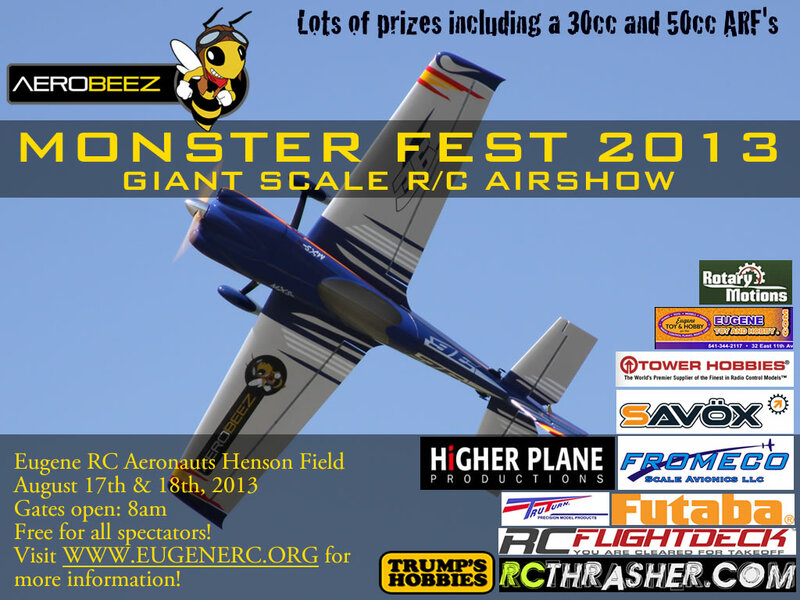 1st Annual AEROBEEZ MONSTER FEST 2013 is set to be our biggest event ever. Update: Date of event has been changed to Aug 17th and 18th! Date: August 17th & 18th 2013!!! That’s right, a two-day event!!! Aerobeez will be donating a 30cc ARF and a 50cc ARF of our choosing for pilot prizes. They will also be coming to the event and setting up a booth and demoing their products! Many thanks goes to Aerobeez for supporting this great event! • Flying Raffle for cool prizes. • No pets over 40 lbs and all pets must be current on shots. There will be an club sponsored BBQ and pool party starting at 6:00 pm Saturday night for all pilots, sponsors and guests that are camping on site, or those pilots that just want to stay and party. Bring a plane and fly – OR – Bring a chair and watch! See below…. Currently we have over $3000 donated in prizes for our pilots!